On May 16, the White House press secretary issued a press release about President Barack Obama's itinerary for July 2009, including visits to Russia and the G-8 Summit in Italy. But what caught the attention of most Africans was the last paragraph of the release, which said, "The President and Mrs. Obama will visit Accra, Ghana, from July 10 to 11. While in Ghana, the President will discuss a range of bilateral and regional issues with Ghanaian President Mills." 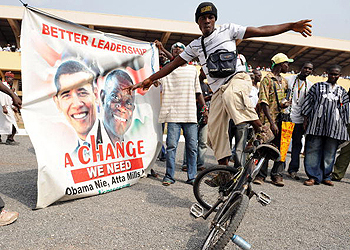 Since the announcement, Nigeria has been ablaze with discussions as to the significance of President Obama's choice of Ghana as his first port of call to sub-Saharan Africa. The last sentence of the press release, which says, "The President and Mrs. Obama look forward to strengthening the U.S. relationship with one of our most trusted partners in sub-Saharan Africa, and to highlighting the critical role that sound governance and civil society play in promoting lasting development," has created confusion, irritation, and anger on the part of some Nigerians as they try to decipher the significance of the statement. Most Nigerians see the "snub" as a strong message to the Nigerian authorities that the Obama administration is not willing to tolerate governments that come into power through corrupt and tainted polls dressed as democracy. On this basis, the stark differences between Nigeria and Ghana are apparent. In 2007, former Nigerian President Olusegun Obasanjo engineered one of the most fraudulent elections organized in Africa, having earlier attempted to perpetuate himself in office for a third term but having been rejected by the Nigerian people. Most observers believe that, had the elections not been rigged, current Nigerian President Umaru Musa Yar'Adua would have been elected. Compare that to the December 2008 elections in Ghana. There was a strong ruling governing party, and President John Kufuor had been acclaimed in the international arena as one of the progressive movers of democratic governance in Africa—facts that could have been employed to perpetuate the ruling party in office. But Ghanaians felt differently and chose the opposition party. The impressive part is not that Ghanaians chose the opposition, but that the margin of votes separating the two parties was less than .03 percent, about 50,000 votes. In most African countries, this could have used by the governing party to retain their hold on the presidency, but Ghanaians made Africans, in fact, the world, proud by the peaceful and concessionary manner in which the government changed hands. Nobel Prize winner Wole Soyinka said, "If Obama decides to grace Nigeria with his presence, I will stone him. The message he is sending by going to Ghana is so obvious, is so brilliant, that he must not render it flawed by coming to Nigeria any time soon." This comment drew the ire of Ambassador Jibrin Chinade, special adviser to Nigeria's President on foreign affairs, said, "Soyinka's statement, which he is entitled to, is most unfortunate and undiplomatic." Chinade chastised Soyinka for taking the opportunity of an art exhibition at the Italian embassy to criticize his country. "It's most unfortunate that a prominent citizen like Soyinka seized the opportunity of a diplomatic invitation to attack his country." But most commentators agree with Soyinka's views and attribute Obama’s non-selection of Nigeria as a reflection of the continued corruption that Mr. Yar'Adua vowed to fight. His failures to crack down on corruption include promptly firing the former corruption czar, Mallam Nuhu Ribadu; the non-implementation of the electoral reform process (another broken promise); and the continued presence of Professor Maurice Iwu at the head of the so-called Independent Electoral Commission, which sends the message that the 2011 elections will be as fraudulent as the ones in 2007. Then there are those who see Obama's snub as something sinister on the part of the U.S. administration. The country's ruling Peoples Democratic Party has brazenly accused the United States and its embassy in Nigeria of plotting to destabilize the country, an accusation that the U.S. has denied. According to ThisDay newspaper, "The plot is for the U.S. Embassy to organize a meeting between the pro-democracy groups in Nigeria and President Barack Obama in Ghana, where the groups would seek to persuade the U.S. President that the administration of President Umaru Yar'Adua is 'illegitimate.'" Others argue that the role Nigeria has played in Africa, including being the leader of the frontline states in rescuing South Africa from the grip of apartheid—as well as peacekeeping in Liberia, Sierra Leone, the Democratic Republic of the Congo and other areas, at a huge human and financial cost to the country, and now playing a major role in ensuring adequate supply of oil to the U.S.—as not being recognized by the Obama administration. They believe Nigeria is being slighted and that its current administration is being punished for the misdeeds of others. The Nigerian government might be trying to shrug off Obama's choice of Ghana over Nigeria, but Nigeria would be wise to look seriously at the issues that have led to this perception that Obama is distancing himself from the debilitating problems in Nigeria. The U.S. has approached the present government as a strategic partner, but the country must demonstrate that it is determined to make amends for past misdeeds. The government could start by removing Professor Maurice Iwu as chairman of the Independent Electoral Commission, by distancing itself from those who have been accused of corruption instead of coddling them, and by putting a credible individual at the head of the corruption agency. Such actions would send a message to the world that the next elections in 2011 will not be tainted as they were in 2007. Being a major supplier of oil to America alone is not going to restore Nigeria to the level of partnership that the Obama administration has sought with Ghana.